I first started working with children and computers back in the early 1970s. I was a programmer for a large computer timesharing company, and I took a briefcase computer terminal with me to elementary school classrooms around the District of Columbia. We dialed up the main computer on the telephone and plugged it into the terminal. I wrote all the programs that I demonstrated to the kids. That's because there wasn't anything else out there. Sure, there was CAI (Computer-Assisted Instruction) courseware available. But that was mostly for older kids, and it was very expensive. I operated my little computer-literacy project on a shoestring. CAI materials were over my students' heads and beyond the reach of my wallet. Then came the flood of personal computers. But still no inexpensive software for children in preschool through early elementary school. Parents and teachers who wanted software had to write it themselves. Or they could find an occasional listing in a computer magazine. 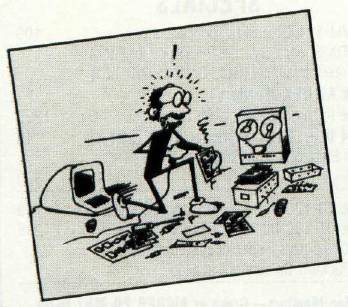 Fred D'lgnazio is a computer enthusiast and author of several books on computers for young people. His books include Katie and the Computer (Creative Computing), Chip Mitchell: The Case of the Stolen Computer Brains (Duttonl Lodestar), and R2-D2's Question and Answer Book About Computers (Random House). As the father of two young children, Fred has become concerned with introducing the computer to children as a wonderful tool rather than as a forbidding electronic device. His column appears monthly in COMPUTE!. Now, suddenly all this is changing. People have finally realized that even the smallest kids can use computers to have fun and to learn. And computers are appearing in people's homes by the millions. By the millions. Thousands upon thousands of the families who now have computers also have little kids. These kids represent an enormous market for software. Software companies and traditional publishing companies are leaping into this market by the dozens. All of a sudden we are being deluged by programs for little kids. In future columns, I will continue to write about the computer friend and about "programming languages" for little kids (see my column last month.) But I will also devote part of each column to reviewing the best of the new software for little kids. If you don't find a major piece of software reviewed in my column, look for it in other COMPUTE! columns (such as in Glenn Kleiman's or David Thornburg's column or in the Reviews section of each issue.) Or write me directly (Fred D'lgnazio, 2117 Carter Road, SW, Roanoke, VA 24015). I'll get the software and respond to you personally. If it merits review, I'll also include it in a forthcoming column. Everybody is going computer. Everything that now appears in a book, in the comics, in the movies, or on TV will soon be loaded into a computer. Within the next few years, we will see all our kids' heroes and superheroes, myths, fairy tales, and favorite characters appear electronically on personal computers. Big Bird, Strawberry Shortcake, and Papa Smurf will all be computerized. So will Batman, Wonder Woman, and Cat in the Hat. So will R2-D2 and E.T. Some of this new software will be junk: dull, of little educational value, using the big names (like E.T. or the Smurfs) only for the purpose of hooking the kids. But there will also be a lot of good software. Its range and diversity will be breathtaking. And it will be fun and educational. Some of the new packages include PLATO software from Control Data Corporation; "Sesame Street" software from the Children's Computer Workshop (CCW is a spin-off from CTW, the Children's Television Workshop); "Dr. Seuss" software and games from Theodore Geiss and Coleco; electronic books from TI that read themselves (using TI's Magic Wand™ bar code reader); plus software from dozens of other major companies and institutions, including the Children's Capitol Museum in Washington, D.C., and Milton Bradley. I'll review all of these major software products in this column and give prices and the names and addresses where the products can be obtained. The flood of programs for little kids is the cutting edge of the computer revolution. Programs for older kids and for adults will also have a powerful impact. But the impact on little kids will be the greatest. Why? First, because they are little kids. Computers will be among the first things they see. Computer-assisted learning will be part of their earliest learning experience. It will affect what they learn and how they learn. It will shape kids' feelings about learning in general. Second, up until now, most learning by little kids has been informal. Very few children today receive sustained, cumulative instruction before the age of five, when they are enrolled in kindergarten. Soon all this is going to change. Four-year-olds, three-year-olds, two-year-olds, and kids even younger will sit down in front of their family computers and run exciting, fun programs that teach them things they otherwise wouldn't learn until they were twice as old. Or even older. Third, much of this learning will be noninstitutional and extracurricular. Educational TV programs like Sesame Street made a stab at turning the home into a "learning center." Now computers and the new "toddler" software will make this possible. Formal learning at home will skyrocket. And it will be largely self-sustained and unsupervised. Parents will encourage their kids to run the programs. But the kids will either do it or not. The amount of learning that takes place will depend mostly on the kids themselves and on the quality of the software they are exposed to. When this class of computer-literate kids enters the public school system, watch out. Each kid will test out at a different grade level on different subjects. The strain on public schools will be enormous. Parents will pressure schools to continue the individualized instruction that the children began at home on their computers. The schools will have to respond. Whether they want to or not, the public schools, from kindergarten up, will be forced to computerize their curriculums extensively. Otherwise, the teachers will be over-whelmed by too many kids operating at too many levels. What will be the outcome of all these changes in terms of children's values and the overall quality of their development? Millions of our youngest children will soon be exposed to computer software embodying all sorts of values. These values will affect the children's emotional disposition, their learning ability, and their social and spiritual development. Little kids are especially vulnerable to new values. Their character still has not fully formed. And yet what supervision are these kids likely to get when they sit down at their computer and run these programs? What control will parents, and even teachers, have on the shape and scope of their kids' development? I will deal with these important questions and others like them in future columns. Also, I'd like to hear from you readers. What are your views? What is the best way to teach little kids? Is it drill? Simulation? Invention? Discovery? Games? Or some combination? The programs now appearing for children are based on one or more of the above learning philosophies. When you are selecting software for your kids, it's good to know which philosophy (or methodology) the software uses. For each of the various philosophies, there are several good software packages. Drill is perhaps the oldest form of computer instruction. In recent years, drill programs have been maligned because they are said to be unimaginative, they don't take full advantage of the computer, and "they program kids, rather than the other way around". But drill programs have a place, especially when they are fun and exciting, and when they teach new facts and concepts. One drill-type package I recommend is The Learning Center, written by Bruce Mitchell. Bruce and his wife Diane run the Small World kinder-garten and preschool in Durham, North Carolina. Diane is one of Small World's teachers. Bruce and Diane also have two young sons. Bruce's programs are based on experiences with his sons, one of whom had a learning disability, and on several years experience with kids at Small World. The programs are divided into three areas: Special Skills, Math and Number Skills, and Language Skills. The Special Skills section covers identification of colors, color names, and shape recognition and differentiation. The Math and Number Skills section covers counting, number recognition, addition and subtraction, and ones and tens. The Language Skills section includes programs for alphabet recognition, letter sequence, and symbol discrimination. Children can interact with the programs using the computer keyboard or an inexpensive light pen sold by The Learning Center's distributor, the Programmer's Institute. The programs are very friendly and easy to use. They are appropriate even for the youngest, non-reading children. My three-year-old, Eric, likes them a lot-especially the "Count with Me" program that lets him "count the monsters." My only criticism is that the color program is sometimes not responsive to the light pen. I learned that this can be corrected by turning up my monitor's contrast control. The problem is present only in the Atari version and will be corrected with a new, more sensitive Atari light pen soon to be available from Programmer's Institute. The Learning Center programs cost $74.95 for a cassette and $79.95 for a diskette. I have the version that runs on the Atari 400/800. I understand they also run on the VIC, the Commodore 64, the TRS-80 Model I, Model III, and Color Computer, the Apple, and the TI-99/4A. Two other excellent software packages are KinderComp and Rhymes & Riddles, distributed by Spinnaker Software Corporation of Cambridge, Massachusetts. Both packages employ several teaching philosophies. They are so attractive and fun to use that they have captivated my entire family, including three-year-old Eric, seven-year-old Catie, and their parents. KinderComp was written by Doug Davis for his daughter Amy. The name makes it sound like a collection of arithmetic programs, but it is really six programs that teach a diverse group of numerical and alphabet-oriented skills. One of the programs is called "Draw." It can be used by even the youngest children (say, kids under two). To work the program, the child twists a joystick and creates multicolored, musical pictures on the display screen. My three-year-old had no problem using Draw to create all sorts of shapes. When I asked him to tell me what he was drawing, I was boggled. "Up here, Daddy," he said, "is an upside-down two. Over here is a house. These are steps. This is the roof. This here is the room where the doggie lives. This is a hotel. That's a big swimming pool. Over here is the fire escape. This green stuff is Hulk Grass. It's bigger than the hotel." Draw is a super program because of its visual and auditory feedback, because it's so easy to use, and because it stimulates a child's manual dexterity, creativity, and artistic skills. "Sequence" helps kids learn number sequence; "Letters" teaches them lowercase letters and the location of letters on the keyboard; and "Match" is a great pattern-matching game. Both the Learning Center programs from Programmer's Institute and KinderComp from Spinnaker are valuable for the specific skills they teach young children. But they are equally valuable as "doorways" for children to enter the world of computers. Even the youngest children can use the computer for fun, purposeful activities that they control. They learn the computer keyboard. They learn how to manipulate and respond to material on the display screen. They learn how to operate the computer and run programs. Computer skills still baffle and intimidate a large number of adults. People once believed that mastery of these skills required a college education. Yet The Learning Center and KinderComp teach these skills to little kids who are still running around in diapers. An important aspect of toddler software is the way it reinforces children's response - that is, the way it responds to kids' right and wrong answers. Both The Learning Center (LC) and KinderComp (KC) score high in this category. For right answers, LC gives a happy face and a happy tune; KC gives a happy face with a wink. For wrong answers, LC gives a sad face and a toot; KC gives a sad face crying a big tear. I like both packages' responses to wrong answers because they are quickly over and do not intimidate a child. I like KC's response very much because the computer doesn't show disapproval or anger when the child errs. Instead it becomes sad. KC is good also because it gives the child hints when he is wrong, and eventually gives him the right answer. But after the child gets an answer wrong, he is not rewarded for later getting it right. This confused my son Eric. When he didn't get a happy face on the screen for an answer at which he had worked especially hard, he wilted a little bit. On the other hand, KC is especially good because it lets the child follow his progress with a string of pluses (+) on the screen (one "plus" for each correct answer). And the child gets a special reward for answering a series of questions correctly. This feature made a big hit with Eric. Last, I also recommend Rhymes & Riddles, another package from Spinnaker. R&R was written by a husband and wife team. The format is "updated, nonviolent Hangman." On the screen appear a bunch of dashes. The dashes represent missing letters. The child tries to guess the letters. By guessing all the letters, a child builds either 1) a nursery rhyme, 2) the answer to a riddle (Sample riddle: Why can't bikes stand up? Answer: Because they are two tired. ), or 3) a famous saying. If a child doesn't guess the right letters after a certain number of tries, she doesn't see some poor little man or woman get hanged. Instead, she builds a sad face, and the program displays the correct letters. All three games (The Learning Center, KinderComp, and Rhymes & Riddles) help kids learn the computer keyboard, the letters of the alphabet, and the spelling of different words. The kids' learning is reinforced with colorgraphics pictures and musical segments taken from nursery rhymes and the children's songs. Commpu Kids ($16/year; $9/half-year) P.O. Box 874, Sedalia, MO 65301. Call (toll-free) 800-822-KIDS. Wide range of articles, tutorials, interviews, stories, puzzles, and games for kids just getting started in computers. Elementary school and junior high. Also, CompuKids Computer Club (for an additional $8/year). Enter ($12.95/year) Children's Televisions Workshop, One Lincoln Plaza, New York, NY 10023. Call 212-595-3456. Like CompuKids, a wide range of articles, stories, puzzles, games, etc. Glossy, full-color format patterned after CTW's Sesame Street and 3-2-1 Contact magazines. For kids seven and up. Turtle News and Logo Newsletter (Kids $9/year; Adults $25/year) Young People's Logo Association, 1208 Hillsdale Drive, Richardson, TX 75081. Call 214-783-7548. Focus on Logo, PILOT, and Turtle Graphics programming, but also features articles and programs in BASIC. Education, entertainment, and material to help kids with special needs. For kids seven and up. All three of these magazines encourage kids to contribute articles, stories, and programs.